While new, radically designed superyachts are always guaranteed to catch the publics attention, there are many owners dedicated to the preservation, restoration and maintenance of fine old pleasure craft. Although the term classic yacht is a relatively elastic one, weve used it for this selection of six timeless yachts for sale. 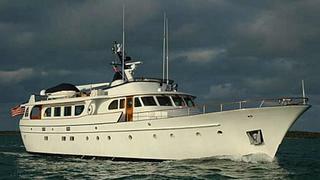 Whit Kirtland at Bradford Marine Yacht Sales has the classic canoe-sterned 29m motor yacht ZaZu for sale. Built in 1970 by De Vries Lentsch, she was extensively restored and upgraded by her present owners in 2011 who have addressed structural, mechanical and cosmetic issues. Now this charming yacht has the best of all worlds: reliability, seaworthiness, fuel economy, and the eye appeal of her renowned Dutch pedigree, combined with the flair of a new Art Deco interior and a vast array of contemporary amenities. Accommodation is for six guests in a master suite and two twin staterooms while twin 460hp Caterpillar engines give her a sedate cruising speed of 10 knots. 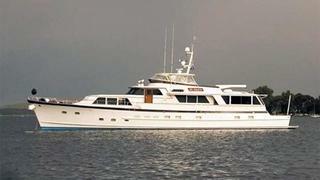 John Todd at Burger Yacht Sales has the 28m flybridge motor yacht Go Fourth for sale. Built in Burger's classic style in 1978, she accommodates six guests in three staterooms and twin Detroit Diesel engines give her a cruising speed of 12 knots. Her traditional profile together with Burger's customary teak trim and railings makes Go Fourth one of the most appealing designs on the waterfront. 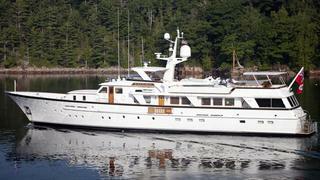 The 38.4m motor yacht Krisujen is for sale with Stuart Larsen at Fraser Yachts. Krisujen is a classic Feadshipraised pilothouse motor yacht delivered by the Van Lent yard in 1982 as Cacique. Accommodation consists of a full beam master suite and two twin cabins with Pullman berths and there is also a smaller mid-ship cabin with upper and lower berths for children or staff. Under her current ownership, the most complete and comprehensive refits have seen Krisujen totally renewed over the past four years. 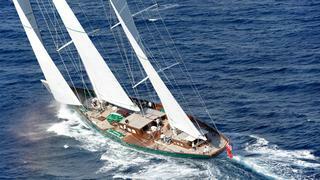 Marc Haendle at Ocean Independence and Bill Sanderson at Edmiston & Company have the 42.85m sailing yacht Hetairos for sale in a joint listing. Built by Abeking & Rasmussen in 1993 to a design by Bruce King with an interior by Andrew Winch, shes a classic wooden ketch of the highest pedigree, designed and built for world cruises and superyacht racing. Still owned by the sailing enthusiast who commissioned her build, Hetairos has been cruising to the four corners of the world, including the Amazon, Alaska, New Zealand, Madagascar, Greenland, Spitsbergen and the South Pacific. The extremely shallow draft of 3.2m allows great flexibility for cruising, while with the centreboard down the yacht has tremendous sailing performance. Accommodation is for 10 guests in a full beam master suite plus two double and two twin cabins. 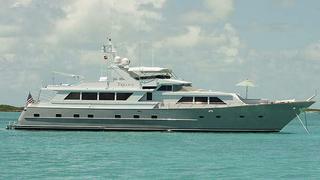 Josh Gulbranson and Michael Selter at Fraser Yachts share a co-central agency on the 31.39m motor yacht for saleTrilogy. Built by Broward Marine in 1988, this classic American superyacht is in excellent condition following several refits, most recently in 2010 when she was repainted and her teak decks revarnished. 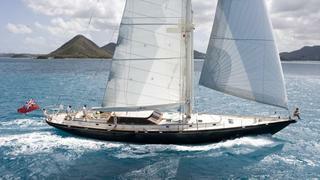 James Munn at Fraser Yachts is listing the 28m sailing yacht Whirlwind for sale. Designed by Andre Hoek and built by Holland Jachtbouw in 1998, she was refitted in 2011/2012 with a new Andrew Winch interior. With ample freeboards, a long coachroof and grand deckhouse, Whirlwind has a surprisingly spacious volume for such a slender yacht. Her semi-classic exterior profile contrasts superbly with the modern interior and, MCA compliant, she accommodates up to eight guests in a master suite and two double staterooms, each with a Pullman berth.